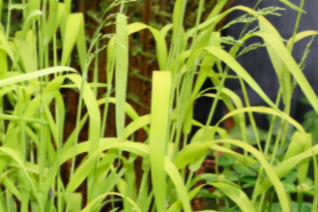 Golden Millet grass we love for its bright and shining appearance in shady woodlands. The upright growing then strongly curled leaf blades appear very much like ribbons. In summer stems rise and then arch with little round seeds. The entire plant is the same shade of glowing chartreuse. To 2′ tall and forming slowly expanding clumps. Shade to part shade in rich, well drained soil with light summer irrigation. Avoid blasting hot sun- it will bleach horribly to an ugly appearance. The combination of the soft, ribbon-like foliage and the airy seed heads is a great texture to counter balance the bold appearance of Hosta or Bergenia ciliata. Completely winter deciduous. Seeds around- and seedling come true and are easy to spot and they move very well. Dies away to nothing by midwinter- seldom even have to cut it back.